Matsuyama is the largest city on the island of Shikoku. Its name means “pine mountains,” and the city is known for its hot springs. These hot springs are some of the oldest hot springs in Japan. Matsuyama is also a castle town, and while parts of Matsuyama Castle were destroyed during World War II, the city has been working on restoration efforts. You can access the castle on foot or by a special ropeway. 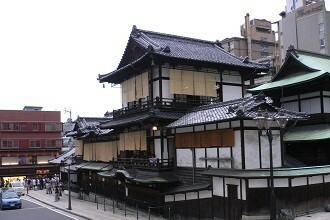 Matsuyama also has 8 of the 88 temples that make up the Shikoku Pilgrimage. Ishiteji is one of the largest and most decorated temples. Once through the gate, you enter a cave filled with many Buddhist statues. After exiting the cave, you will find yourself in the inner temple grounds, which contain more historical statues and carvings. Matsuyama is a great city with a lot to do. There’s a taste of everything here for everyone, whether you want to find a quiet place to relax, go out for drinks with friends, explore historical/cultural Japanese areas, etc. I love that about Matsuyama. It’s not possible to be bored here unless you choose to be. There’s always something to do, and it’s great because it’s all easily accessible by bike or even on foot! Before coming to Matsuyama, I had no clue what to expect. I couldn’t find much information about Matsuyama before I got here. I didn’t expect Matsuyama to be as big as it is. It is very easy to live here and the people in Matsuyama are extremely kind. I imagined coming to a small town in the countryside, but instead I’ve found myself in a lively city with a beautiful of the castle wherever I go. My cousin came to Japan and I was able to take her around Japan. I met her in Hiroshima (which is only a ferry ride away from Matsuyama) and introduced her to Hiroshima-style okonomiyaki. I’m happy to say that by the time she came to visit me, I already knew enough about Japan that I was able to get around easily and take her to see local as well as touristy areas in Japan. We then went to Matsuyama together. I had to work for a few days before the vacation period, so my cousin explored Matsuyama by herself. She couldn’t speak or understand Japanese at all, but was able to get around, eat at restaurants, and enjoy Matsuyama sights on her own. One of the days, my co-worker actually took her out for me since she wasn’t working, and another day one of my students did too. I feel so lucky to have them. Once the vacation period started, we traveled to Kyoto and explored Kyoto, Osaka, and Nara for 4 days. We met with my friends in Osaka and went to many traditional temples, ate lots of great food, and my cousin even took pictures dressed up as a maiko! We then went to Tokyo for 3 days, saw another friend there, and enjoyed the big city. It was my first time to Tokyo too, actually. We had a great time sightseeing and experiencing Tokyo together. I was very happy that I was able to show her around.